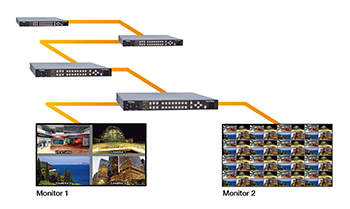 The MV-1620HSA is a compact (1U) multi-viewer that accepts up to 16 channels of mixed 3G/HD/SD-SDI or analog composite signals for monitoring on one or two screens. It can be cascaded with other units to display up to 64 sources at once. Full-featured, the unit offers a customizable window layout. View audio levels and use AFD-compatible cropping or information display as needed.